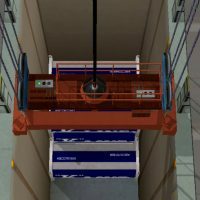 The Transas Crane Simulator is designed for crane operator training in both routine and emergency conditions. The simulator provides a realistic and safe learning environment, helping to reduce risk of accidents and decrease training costs. Minimizing the crane load and number of control actions, providing the necessary movement dynamics. A PC-based crane cabin mock-up with control panels, joysticks and monitors for displaying the 3D visualization. Network Configuration represents several connected PC-based workstations for joint training under instructor supervision. Exact replica of a crane cabin interior.